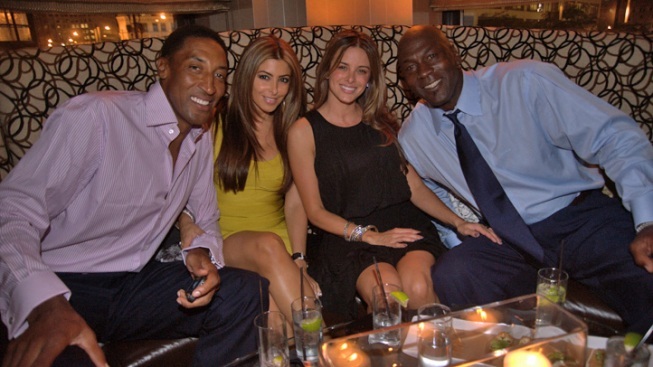 Scottie Pippen and wife Larsa joined Jordan and now fiancee Yvette Prieto at the September opening of his new Michael Jordan Steakhouse. Michael Jordan is ready to make that leap again. The former Chicago Bulls hoops legend is engaged to his longtime girlfriend, Cuban-American model Yvette Prieto, Charlotte TV station WCNC first reported. The engagement has been rumored for some time, but the confirmation came from a Jordan spokeswoman. The Associated Press also confirmed the couple of three years was getting hitched. The Charlotte Bobcats majority owner was married to his first wife, Juanita Vanoy, for 17 years, but the two divorced in 2006. The ex-pair has three children: 23-year-old Jeffrey Michael, 21-year-old Marcus James and 19-year-old Jasmine, according to People. A wedding date has not been released.